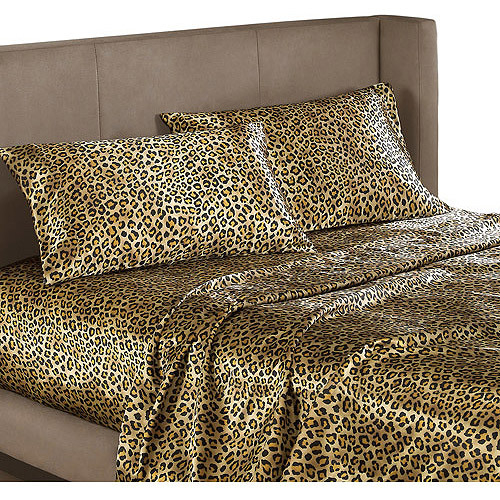 With this Leopard Satin Sheet Set, you get a flat sheet, a fitted sheet and matching pillow cases. All the items in the Mainstays Sheet Set are made of 100 percent polyester satin for ample luxury and comfort. These polyester bed sheets are machine washable, so it’s easy to keep them clean. The flat sheet and pillowcases of the Mainstays Satin Sheet Set each have a 3″ hem. This Mainstays Satin Sheet Set is available in Full, Queen or King size. Available also in Zebra print.